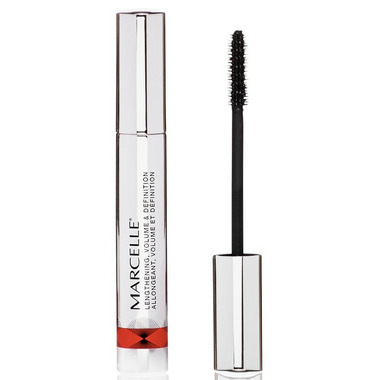 Open your eyes to beautiful lashes with the Marcelle Volum'Xtension Magnetic Mascara. With its three different kinds of bristles, this flexible polymer brush perfectly plumps and thickens lashes by ensuring that each lash is covered and stretched out to the max! It separates and defines lashes to give them incredible length and definition for a fuller appearance. Great for daily use; is smooth, separates, stays on nicely, doesn't clump. However, if you go to bed with it on I swear you wake up with more mascara smeared around your eyes than you put on in the first place... Still my go-to, however. Best mascara I've used so far. Applies smoothly, no clumps, survives well in cool temperatures. Wears off more quickly in warmer climates. However, non-irritating, ideal for sensitive eyes, and a good, everyday mascara. Fantastic mascara! Does a great job grabbing every little lash, adding volume and length. Better than other mascaras that are twice the price. Love this! I've been looking for a great everyday mascara forever and this is definitely a winner...especially for the price. Doesn't smudge during the day but still cleans off nicely.